Fifth in a series of stories highlighting sponosrs/participants in the Alzheimer’s, Dementia Hospital Wristband Education Project. 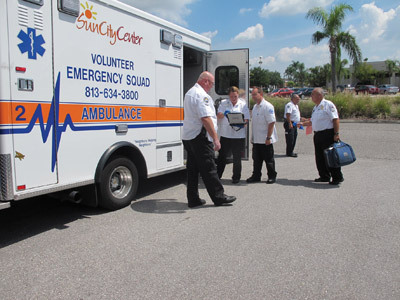 Sun City Center Emergency Squad volunteers gear up last Thursday. From left, Paul O’Connor, Team 8 captain; Cat Rogers, EMR technician; Erik Sager, EMR trainee; Pete Derupo, Team 5 captain; and Tom Murphy, assistant chief of safety. Lia Martin photo. Robin Watt, Sun City Center Emergency Squad assistant chief, says that 30 percent of the emergency calls they answer are related to falls. 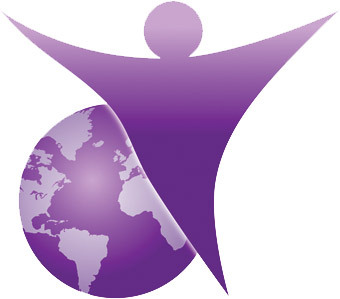 According to Watt, one of every three people over 65 years old will experience a fall, and 20 to 25 percent of the people they help have Alzheimer’s disease, or dementia. If the person having a medical emergency calls 9-1-1, the Hillsborough County Fire Department is called as the first responders. The SCC Emergency Squad has its own emergency number: 813-634-1411. Unless there is chest pain, or difficulty breathing, the Emergency Squad can give assistance. Squad members help people in Sun City Center as trained volunteers for free. A not-for-profit, the Squad is funded by donations, which saves local residents around $500 per transport, with Medicare paying a portion of the transport. Watt knows that when any one of their volunteers answers an emergency call locally there is a strong likelihood that the person they will be helping will have some form of dementia. In a city where the median age is 72, it is not surprising to know that elders are in their mid-90s, or even older than 100 years. As we learn more and more about dementia, those, like Watt, in charge of caring for those afflicted with it or Alzheimer’s disease need to adjust their approach when dealing with such persons when there is a medical situation or emergency. Watt says that when their emergency calls take them to one of the assisted-living facilities, in particular the “memory care” facilities, 90 to 95 percent of the patients there will have dementia issues. As prices rise, often family members now take care of their parent or spouse at home. There are delicate issues and concerns that face Watt and other volunteers at the Emergency Squad when it comes to responding to emergencies with dementia-related patients. There was one instance, Watt says, a man had collapsed at home. The wife had called in the emergency. When they arrived, he was lying on the floor. They immediately began questioning the wife about her husband: his condition, medications he was taking and so on. What happened next was confusing. The man, who had collapsed and was unconscious, was the caregiver. His wife had dementia. She knew enough to get help, but answering any other questions about his medical health was beyond her capabilities. They lost valuable time before they realized the reality of the situation. It is known that caregivers and family members who take care of the dementia or Alzheimer’s patient often die before the ones they care for, according to Watt. In the case of first responders, Watt says it is important to know immediately whether or not their patient has dementia issues. Watt thinks that a wristband, for someone with a permanent, or temporary dementia-related illness, could be a great thing. Currently, the Dementia/Alzheimer’s Hospital Wristband Project is putting wristbands on patients while they are in a hospital setting. Watt would like a wristband to be worn by dementia patients 24/7, so emergency responders could better serve their clients. There are as many as 400 trained volunteers serving at the Sun City Center Emergency Squad in the winter, with 30 to 50 volunteers on each team. The SCC Emergency Squad is in need of volunteers who are able to help with patient contact, either EMRs, EMTs or ambulance drivers. Forty hours of education are required of new volunteers, plus certification of having passed a CPR course. A volunteer receives EMR training at the Squad’s training facility. The volunteer is then an EMR trainee, with a mentor, still receiving help until he or she is technically equipped to go out on a call with the team. If the volunteer wants to continue on with his training, he can get EMT training at a local community college. Seventy-five percent of volunteers have had no prior medical training at the Emergency Squad. For more information on volunteering, call 831-633-3800.